Nathan Peterman is a professional football player in the quarterback position currently signed to one of the franchises in the NFL. One major thing that has characterized Peterman’s life and career is his ability to withstand adversity whenever he is put down with one. This has served him well so far in his chosen career and here, you will learn everything you need to know about him including these five facts about him. Nathan Peterman is a professional NFL player who currently plies his trade with the Buffalo Bills. He was born on the 4th of May 1994 in Jacksonville, Florida. Nathan had his high school education at Bartram Trail High School where he recorded some impressive feats that got him a scholarship to the University of Tennesse. Nathan then spent three years (2012-2014) at the University of Tennessee where he suffered a series of disappointments. He was redshirted in his first year. In his second year at Tennessee, he finally got his chance to play but suffered an injury that sidelined him for the whole year. The third year was not much better as he did not get many playing opportunities. He recorded some poor stats as a result of this, however, a bright side to his stay in Tennessee was that he was able to complete four years of school in three. Keen for a chance to restart his career, Nathan Peterman joined the University of Pittsburgh as a graduate student in 2015. At the school, he got more playing time and utilized it to show the stuff he was made of. He had 2 stellar seasons with the school, recording a total of 619 attempted passes (out of which 378 was completed) for 5,142 yards with 47 touchdowns and 15 interceptions. He also obtained a Masters in Business Administration from the school. Nathan Peterman was a 5th round pick (171st overall) during the 2017 NFL draft as he joined the Buffalo Bills. He had a dismal rookie season with the Buffalo Bills; he took part in only four games and recorded 49 attempted passes (out of which 24 was completed) for 252 yards with five interceptions and 2 touchdowns. In week 11 of the season, he gave a very poor performance. In the first half of the game, which was against the L.A. Chargers, he attempted a total of 14 passes out of which five were intercepted. To put this in context, since the formation of the modern NFL league in 1970, nobody has had that number of their passes intercepted in a half. Thus Nathan holds that unenviable record. In the aftermath of the game, he was roasted by fans and analysts alike but if there is one thing everyone agrees on, it is the fact that Nathan Peterman has the ability to bounce back from difficult times. He has gone on to give a good performance in preseason and has been named the starting QB for the Buffalo Bills for the 2018 season thus giving him another chance to redeem himself. The footballer is married to Morgan Peterman. 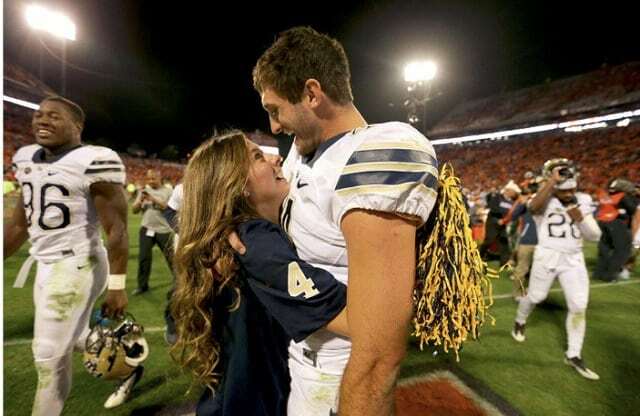 They started dating in 2012 while they were both at the University of Tennessee. Following their relationship, they got married on the 30th of April 2016, the same weekend that Nathan was drafted into the NFL. Morgan holds a degree in sports management and business administration and is also a certified personal trainer. The couple have a puppy named copper. Nathan, whose Twitter bio reads ‘follower of Christ’ is a devout Christian who gave his life to Christ at the age of six after a Billy Graham crusade. His family is also a devout Christian family. Peterman comes from a family of five which includes his dad; Chuck Peterman; mom, Dana Peterman and two older brothers, Aaron and Ryan Peterman. His father is a pastor and founder of the Creekside Christian Church which has no less than 1,000 members. Nathan’s brother, Aaron is also a youth minister in a church in Georgia. The footballer credits his Christian faith with helping him survive some of the tough times he has faced in life. Nathan Peterman has quite an imposing physique. He weighs 225lbs or 102kg and stands at 6 feet 2 inches tall. There is no doubt that his strong stature will play a very important role in helping him deal with the defensive backs in the NFL as his career further progresses. Peterman is worth $1,260,000. This represents his career earnings over the first two seasons he has spent with the Bills; He earned $525, 000 in 2017 alone. There is no doubt that his value will increase as he sees out his four-year contract with the Bills. The contract is worth $2, 639, 499 with $239, 499 guaranteed and another $239, 499 in signing bonuses. The amount also includes an average annual salary of $659, 875.